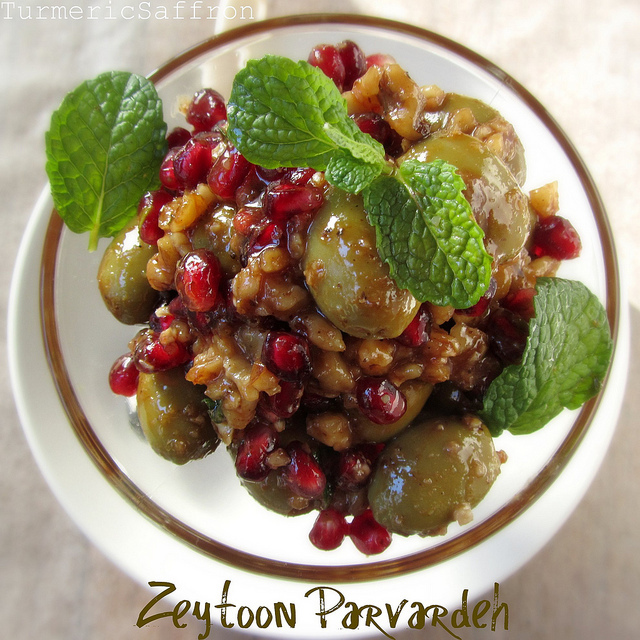 This quick ترشی پیاز torshi-e piaz is easy to make and doesn't require a long aging process before they can be eaten. 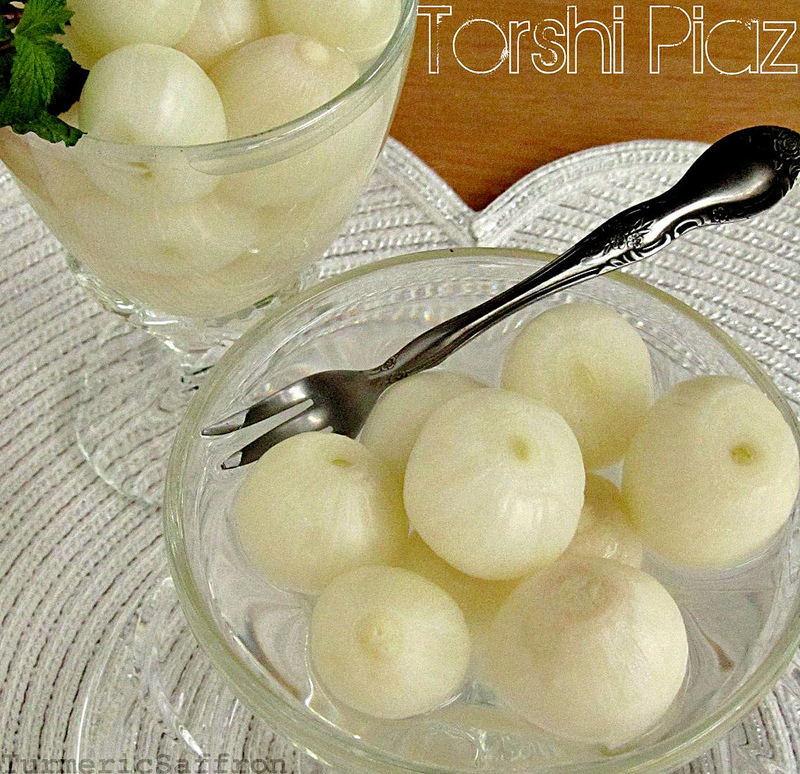 Torshi is a very popular condiment that is served along with meals at lunch or dinner. 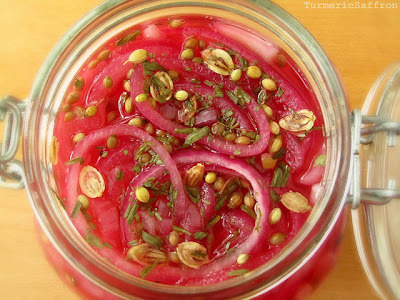 There are almost as many different torshi varieties as there are popular vegetables and some pickles are made with more than one kind of vegetable. For example, Iranian style vegetable pickle recipe (torshi makhloot) calls for eight different vegetables that are cut into tiny pieces combined with many fresh and/or dried herbs and spices. There is also torshi miveh (fruit torshi), my mother's special recipe that's made with many different fruits and vegetables and is the only torshi that tastes a bit sweet because of the addition of dates and a piece of nabat (rock candy). Torshi is mostly made with vinegar and the taste is rather "torsh" (sour), hence the name. 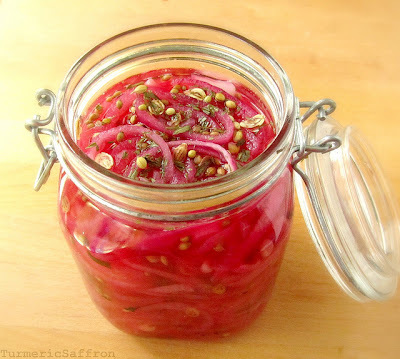 I find pickling very enjoyable and rather calming. Perhaps because it's not an everyday activity like cooking or maybe it's the idea of preservation that's appealing or simply the fact that torshi is delicious and irresistible. 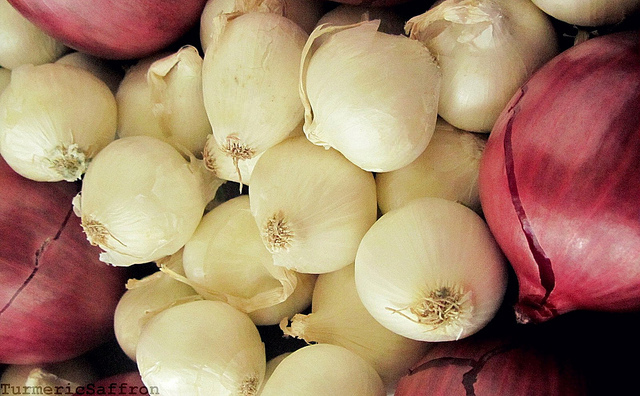 Onions are widely used in Iranian cuisine. Usually, making piaz dagh (fried onions) is the first thing I do when I start to cook any kind of khoresh. Fried onions are also used as a garnish for ash (hearty soups) and some rice dishes. Onions are also served freshly sliced or sectioned with main dishes such as chelo kabab, lamb stew (abgoosht) and most rice and khoresh varieties for lunch. 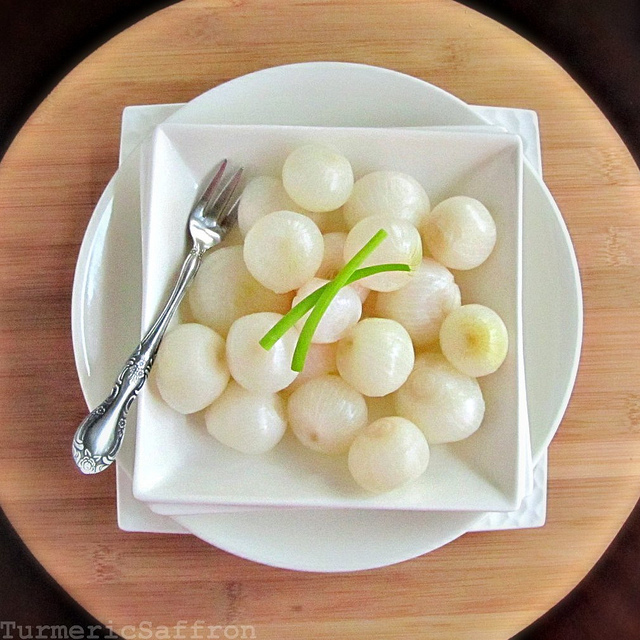 Sauteed, caramelized, pickled or raw onions absolutely enhance the flavors of most dishes and are essential in cooking. 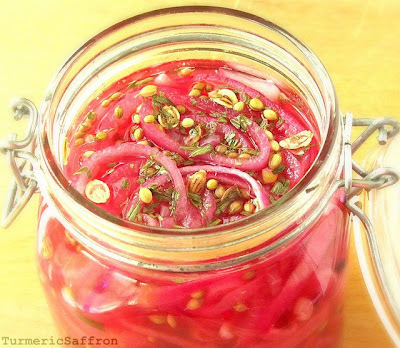 Thinly sliced, gorgeous pickled red onions and the petite pearly white pickled onions would make a good substitute for the raw onion that many of us grew up with and still enjoy (mostly on weekends). In a small bowl combine dried tarragon, savory, coriander seeds, crushed angelica and nigella seeds. Pour vinegar in a non-reactive pot, place on the stove and bring to a gentle simmer on medium-low heat. Stir in the spice mix, add the red pepper and let it gently simmer for about five minutes. Place the sliced onions in the pot with vinegar and spices, add salt, gently stir with a wooden spoon, simmer for another 5-7 minutes. Remove from heat and let vinegar cool to room temperature. Pour the onions and vinegar into a clean and dry glass jar with a tight fitting lid. Make sure all ingredients are covered by vinegar. Add more vinegar if needed. Close the lid tightly. This pickle is ready in 2-3 days. 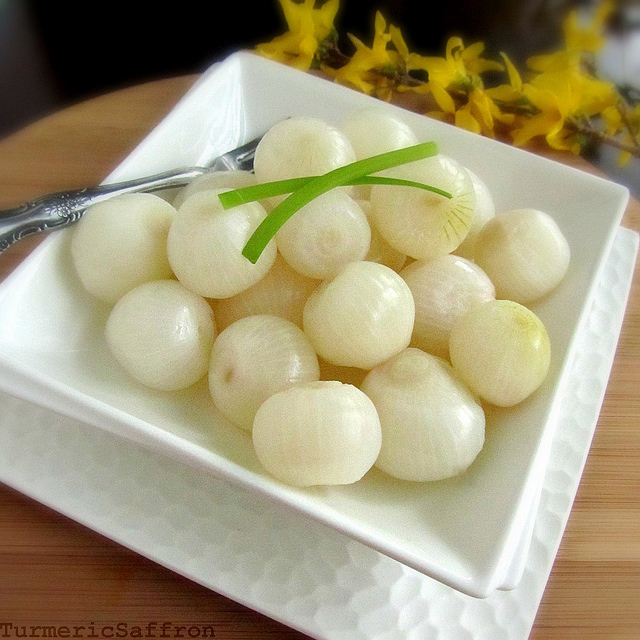 For pickled white onions you may use the same spices listed in the above recipe and a pinch of turmeric for a tastier torshi. 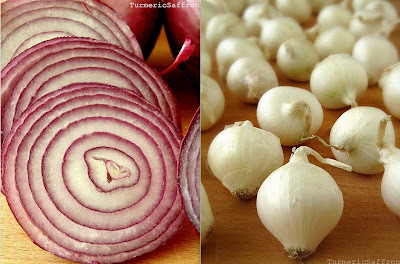 However, if you would like the onions to maintain their color, here's a simpler recipe with only a few ingredients. Bring vinegar to a gentle simmer in a medium non-reactive pot on medium-low heat. Place the onions and the red pepper into the pot, add salt and stir. Simmer for 5-7 minutes. Transfer the onions and vinegar into a clean glass jar. Place the whole tarragon and the pepper in the center of the jar, for easy removal later on. Add more vinegar if needed. Close lid tightly. Keep in a cool and dry place. This is awesome. I suppose these can be kept for a while. It looks like a delicious torshi. I should try this recipe. Mahdi, thanks for visiting and I hope you'll give this recipe a try! The Bird Cage, I'm so glad you gave this recipe a try and I hope you enjoy it as much as I do! These recipes look very good, I'm going to try them out! But do you know how long they will keep? Anayokari, thank you! I'm glad you're going to try it. You can keep these pickles up to 12 months. What kind of non-reactive pan/pot would you suggest for making torshi in general? Thank you. high quality stainless steel or enameled cast iron pots and pans. Itʻs very nice Azita Jan! Amay jan, hopefully I'll have a new post early next week! Thank you. Azita jan, for how long will the pickle last? If we place the onions raw in in vinegar without cooking, will the pickle last longer? Amay jan, Pickled onions keep well for several months. Pickled raw onions should last longer. Patricia, you can skip it if you cannot find it. I don't know of any substitute for angelica. Its flavor is so unique. Thank you.